Many cellphone users are wondering whether their Android and BlackBerry devices are spying on them after security researcher Trevor Eckhart recently claimed that a piece of diagnostic software on the phones was acting like malware. Eckhart said the software, created by company Carrier IQ and installed on devices by phone manufacturers and carriers, was secretly recording user data such as keystrokes and Web browsing history. Carrier IQ's software is on more than 140 million handsets worldwide. Carrier IQ diagnostic software comes installed on many phones including Android and BlackBerry devices, according to Eckhart. 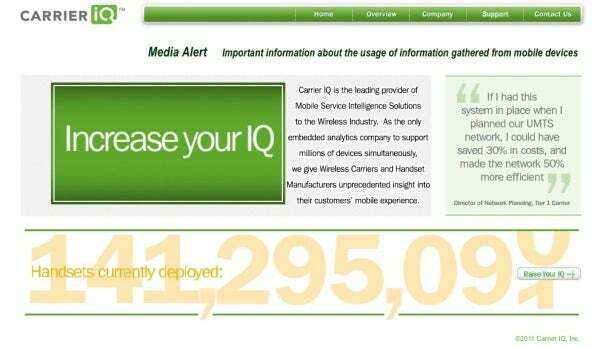 Carrier IQ software was later discovered on iOS devices but it appears to be benign. Developer Grant Paul (no relation to the author) claims that on iOS devices, Carrier IQ software was accessing a more limited set of information including your phone number, carrier, country, when a phone call is active, and your location if Location Services is turned on.